Becky Knows Everything: Easter Brunch Success!! My Easter brunch was a delicious happening. 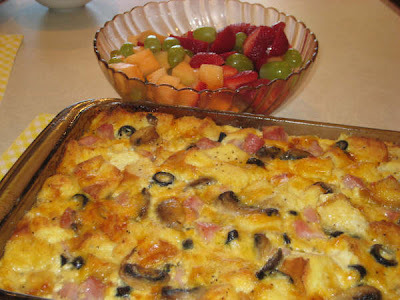 The Ham and Cheesy Brunch Bake turned out bubbly and oh so pretty. The Macadamia Nut French Toast was crisp and when you poured on the maple syrup, you were in brunch heaven. And T. from San Diego writes “What a delicious casserole and since you could make it the night before, it was even better. Thank you, thank you, thank you.” WOW! I love positive responses. So great to hear from all of you. Keep cooking, keep having fun and send along any recipes you think readers might enjoy. Happy Spring!